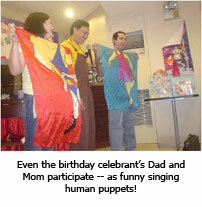 Ony Carcamo's talking puppets will make your child's birthday party a most memorable one. 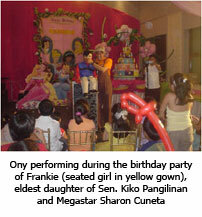 When Kuya Ony (as his kid audience loves to address him) performs in your kid's party, your guests will definitely love you for giving them a one-of-a-kind, fantastic sight and sound experience they'll always remember. Ony does around 30-40 minutes of fun-filled, interactive ventriloquism show; featuring colorful characters that kids and adults adore. His acts are not only entertaining, but educational as well because he talks about relevant messages, like health and fitness, friendship and peace, safety rules, self-esteem, and a lot more. He has audience participation routines to make sure your guests get involved in his refreshingly original live act. Ony may even turn a few of your loved ones and friends into human dummies on stage! He arrives at least 30 minutes before his show time, he sets up his props in just about one minute, and he guarantees his clients' satisfaction. He makes sure you're relaxed and ready to enjoy the program with your guests. Ony always makes a strong, indelible impression. Encouraging word of mouth follows him wherever he goes; and that should be music to your ears! Ony is a true master when it comes to school assembly shows. Since 2000, he has performed for hundreds and hundreds of public and private schools around the country. What makes his school shows unique? Ony uses his puppets not just to entertain the kids, but to teach them character-building concepts such as health and hygiene, math, science, self-esteem, safety, and friendship. Principals and teachers are astounded on how he holds the attention of a huge number of kids for nearly an hour! 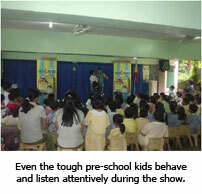 Ony does regular school tours, shows for school family day and anniversaries and other school activities.